We drove from Helsinki to Turku after coming back from St Petersburg. It was around 3 hours ans we took it slow. We were both tired. Arriving at Turku ferry boat harbor, we went to Viking line office to book a ferry for the same evening. The ticketing officer said “the next ferry available is for Saturday”….. 4 days latter… hmmm bad planning we should have booked this in advance, given the fact that it is the peak season. Then we went to the Silja terminal and finally we managed to get a place on the ferry that evening. According to him, it was the last spot for the vehicle. Our trip started around 8pm. It was a nice ferry….. with entertainment and we had a perfect cabin. We did walk around the ship for a while then after few drinks went to bed to be able to wake up at 6 am upon arrival in Stockholm. We were the first to get out of the ferry we drove to a nice parking place on the coastal line of Stockholm, were all the embassies are situated. We even saw the Sri Lankan one! Had our breakfast and set out to tour the city in the morning. We started with the King’s palace. It is an enormous palace where the kings use to live in the past. 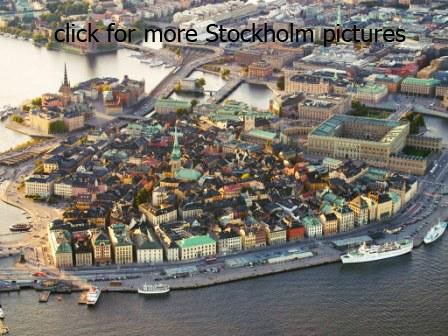 We then decide to take a canal cruise to see the most interesting places of the city….. Gamla stan, one of the largest and best preserved medieval city, the Royal Palace, The Vasa Museum ( even though we did not go in), Fotographisca and the City Hall. We then went back to the Royal palace at 12 15pm to watch the ceremony of changing guards…. That was a spectacle. Canoeing in Bolmen lake for five days. It was the third week in to our trip. We drove from Oslo to south of Sweden. We knew where we wanted to go. 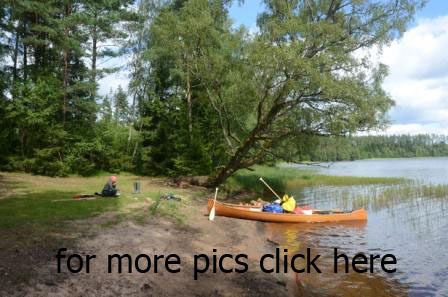 We had the canoe guide book for Sweden and recommendations from Claudia and Pascal. We were all set for a 5 day canoe tour in the Bolmen lake. We arrived in Bolmso camping ground quote late that night. The next morning we bought the fishing license and few more things needed for camping during our trip in the wild and drove to Odensjo. We parked the motor home near the church of Odenjo and packed the canoe. Around 2 30pm we were ready to start. After 15 minutes of paddling, we stopped for our first break. A great waffle café was recommended by Claudia and Pascal which is only open once a week on Sundays, so we did not want to miss it. After a crispy waffle and a goods pot of back coffee we started paddling again towards the north of Bolmen Island. After 3 hours of Canoeing we decided to look for a place to set up our camp for the night. We easily found a good camping ground, and to our amazement we were the only once there. It did not take more than 20 minutes to set up the tent and another tarp as a sitting area, where we set up our table and chairs. Having caught no wish we prepared pasta for dinner…. Lovely evening spent in the wild with a good glass of red wine. That night was my first night in the wild…. I have never done this before in my life… what a silence.. you only hear the light waves of the lake, birds and wild animals…. if not it is dead silent…. After a good camping breakfast, we packed everything and started paddling the second day. We wanted to go up to the northern tip of the Bolmen Island. Took us some 4 to 5 hours…… I enjoyed being in the water.. your day is decided by the nature, by the weather and by how hard you can paddle…. Simple life….. It was not difficult to find a place to sleep the second night as well. We found a nice secluded white sand beach to put up our camp. It started to rain a bit so we had to be fast in putting up the tent and the tarp. Another nice dinner cooked and enjoyed with a glass of red wine. The third day in to our trip in the wild, we had some bad weather.. suddenly we had an ice rain in the morning and the lake became rough and rougher…. We decided to stay in land the full day.. enjoying the wild…. Trying to pick blue berries and enjoy the moment…. I cooked a sri lankan meal for lunch, which made us warm and full…. Forth day early in the morning, we had breakfast, packed the tent and started paddling towards the other side of the Bolmen island. We roughly knew where we wanted to go… But it took us more time than we thought as the lake was a bit rough. So we made a break towords 2pm, to go to a village close by, to have some lunch and get ourselves informed about the area. The village was small, the centre of the village was a small junction with a patrol station m a small super market, which had a café in built and a bicycle rental. After paddling another 2 hours, we found a very nice camping place to spend our last night in the wild. After four days in the canoe, with minimal stuff to carry with… life seems to be so perfect.. so down to earth and so fulfilling.. only sounds you hear are the sounds of birds and animals or sounds of the lake… only scenery you have is a scenery of the beautiful lake… at times blue at time green at dusk more colorful…that night we both went for a sun downer swim in the lake before dinner. I thoroughly enjoyed these few days in the nature…. Last day I was quite sad to believe that this is coming to an end… but I was at the same time happy to be going back home, precisely to our motor home. Another 5 hours of paddling we arrived safely to Odensjo, where we parked our mobile home. First thing I did was to have a nice long warm shower.